Likewise, the 'study of the work of the ages of Art', a reference to the appreciation of art history, was equally important as Morris encouraged artists to look to the past for their inspiration believing that the art of his own age was inferior. Morris' solution was for a return to the values of the Gothic art of the middle Ages, where artists and craftsmen had worked together with a common purpose: to glorify God through the practice of their skills. The model for this solution was the medieval crafts guilds which he saw as a type of socialist brotherhood where everybody fulfilled themselves according to their level of ability. Morris felt that this would enhance the quality of life for all, and that artistic activity itself would be seen as a force for good in society. The medieval crafts guilds were groups of artists, architects, and craftsmen who formed an alliance to maintain high standards of workmanship, regulate trade and competition, and protect the secrets of their crafts. The guilds were usually composed of smaller workshops of associated crafts from the same town who banded together into larger groups for their own protection and prosperity. They operated on a Master, Journeyman and Apprentice system where the master would take on apprentices to train them in the skills of his craft. The apprentices were 'bound' to work for free for that master for a period of around five to nine years. In return, the master would look after their welfare and education in the skills of his craft until they graduated as journeymen. As journeymen, they were not only paid for their work but also free to go and work for other masters. In time, if a journeyman demonstrated outstanding skill in his craft, he could advance in the guild to the position of master and take on his own apprentices. Morris was one of the great pattern designers. His classic designs are still commercially available as wallpapers and textiles. His patterns are inspired by his intimate knowledge of natural forms discovered through drawing and stylized through his detailed knowledge of historical styles. They were usually titled with the names of the flowers that they depicted such as 'Chrysanthemum', 'Jasmine', 'Acanthus', and 'Sunflower'. In effect, Morris took the natural forms that he found outside in the woods and meadows and used them to decorate the inside of our homes. His wallpaper designs were echoed in his textile, tapestry and carpet designs. Their images are similar, only simplified due to the limitations of a coarser medium. 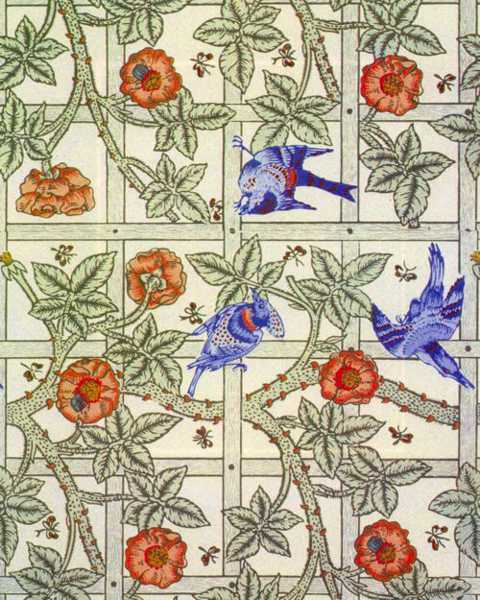 Morris' design for 'Trellis', his first attempt at a wallpaper design, was based on roses growing over trellises in the garden at the Red House, his classic Arts and Crafts Movement home, at Bexleyheath in Kent. The pattern shows a medieval influence as it is recalls the ornamental decoration to be found on illuminated manuscripts and tapestries. The birds and insects which were later added to the final design were drawn by Philip Webb, the architect of the Red House. 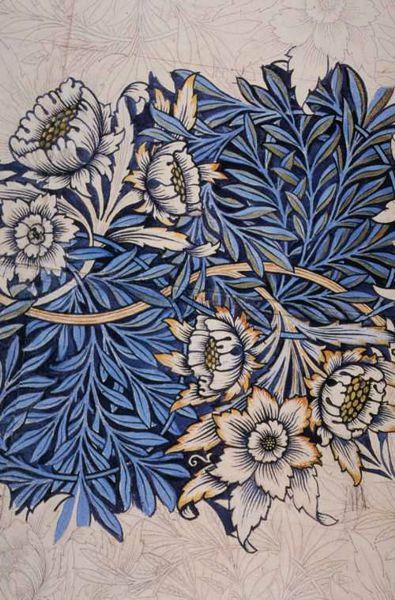 'Trellis' was one of Morris' favourite designs and he chose it to decorate his bedroom at Kelmscott House in London where he spent his final years. 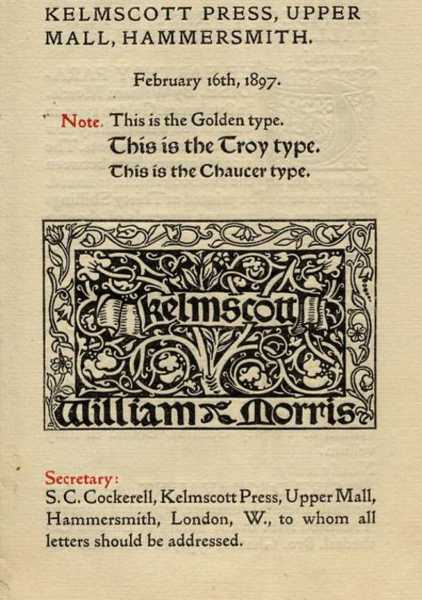 In 1891, Morris founded the Kelmscott Press, named after the village near Oxford where he had lived since 1871. The Kelmscott Press produced high quality hand-printed books to be seen and cherished as objects d'art. Morris designed and cut the typefaces, ornamental borders and title pages which were based on the style of medieval manuscripts, while the illustrations were created by the Pre-Raphaelite artist, Edward Burne-Jones. The books were printed on handmade paper, copied from 15th century Italian samples, and bound in vellum. Although Morris looked to the past for inspiration, his aims anticipate modernist ideas on typography and layout: 'I began printing books with the hope of producing some which would have a definite claim to beauty, while at the same time they should be easy to read and should not dazzle the eye......I found I had to consider chiefly the following things: the paper, the form of the type, the relative spacing of the letters, the words, and the lines; and lastly the position of the printed matter on the page'. Altogether Kelmscott published 53 titles (18,000 copies in all), including 'The Nature of Gothic', a chapter from 'The Stones of Venice' by the art critic, John Ruskin. 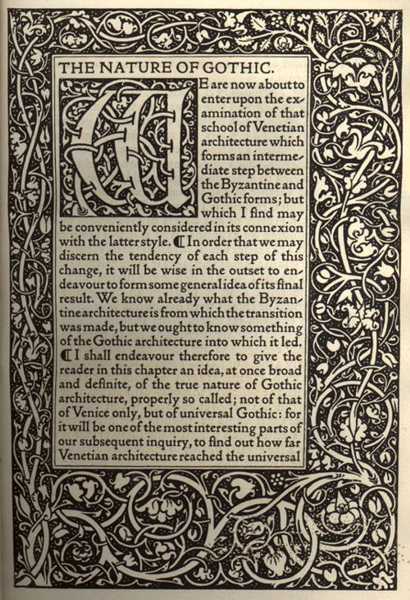 Morris, who wrote the preface praising the book, had been greatly inspired by Ruskin whose writings influenced the Arts and Crafts movement by encouraging the revival of Gothic art and architecture. The Kelmscott Press was never a financial success as their beautifully hand-crafted books were too expensive to produce at a profit. It was an enterprise that Morris ran simply for pleasure. Kelmscott only ran for seven years and closed in 1898, two years after the death of Morris. However, the high standard of their output inspired a revival of the private press across Europe and America and influenced the development of typography and graphic design in the early 20th century. 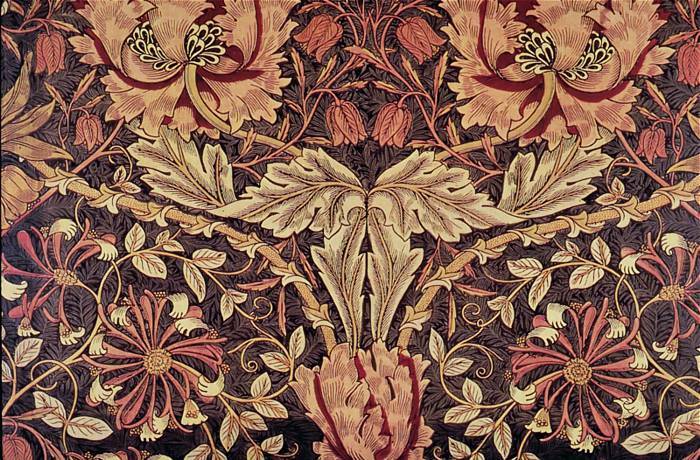 The Arts and Crafts Movement (1850-1900) was a reaction against the Industrial Revolution. The development of the steam engine by James Watt in 1765 led to the mechanization of industry, agriculture and transportation and changed the life of the working man in Britain. The cities and towns grew to accommodate the expanding industries and the influx of workers from the countryside looking for employment. However, living standards gradually deteriorated and industrialization left people with a sense that their life had changed for the worst. 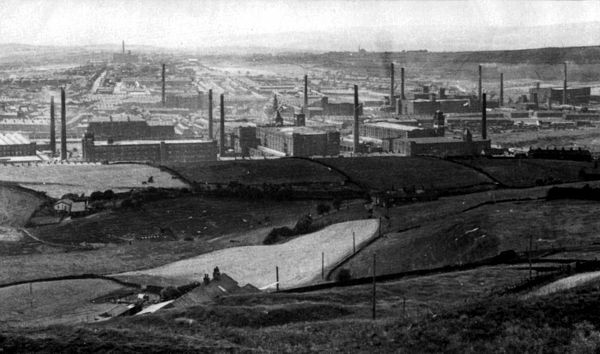 Many had sacrificed a rural lifestyle 'in England's green and pleasant land' for the sake of a job in the 'dark Satanic mills' of the Industrial Revolution. As a result, they lost that feeling of security and belonging which comes from living in smaller communities. The members of the Arts and Crafts Movement included artists, architects, designers, craftsmen and writers. They feared that industrialization was destroying the environment in which traditional skills and crafts could prosper, as machine production had taken the pride, skill and design out of the quality of goods being manufactured. They believed that hand crafted objects were superior to those made by machine and that the rural craftsman had a superior lifestyle to those who slaved in the urban mills and factories. They were convinced that the general decline of artistic standards brought on by industrialization was linked to the nation's social and moral decline. The Arts and Crafts Movement formed into various crafts guilds to try to recreate the dignified working environment that existed in the medieval crafts guilds. They gave themselves names such as the Century Guild, the Guild of Saint George, the Art Workers Guild and the Guild of Handicraft. The Century Guild was the first of the craft guilds to form. It was founded in 1882, under the influence of William Morris, by the architect and designer A.H. Mackmurdo. 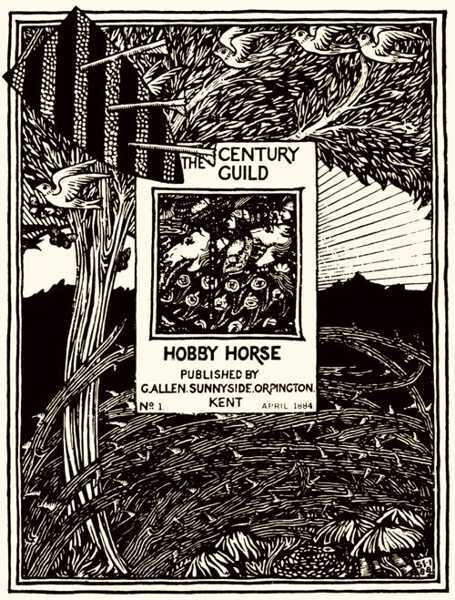 In 1884 the guild published a quarterly journal called 'Hobby Horse' to promote their aims and ideals. In particular, they championed the craft of printing as an art form which inspired Morris to found the Kelmscott Press. Among other noteworthy guilds was the prestigious Art Workers Guild, whose membership included lecturers and principles from the leading art schools. Walter Crane, the principal of the Royal College of Art in 1897-8 and a renowned illustrator of children's books, was a founding member. The architect and theorist, W. R. Lethaby, the first Professor of Design at the RCA, became the original director and co-founder of the London Central School of Arts and Crafts, the first college to introduce craft workshops to promote Arts and Crafts principles within mainstream art education. This integration of design with art education is one of the great legacies of the Arts and Crafts Movement. Despite its high ideals, the Arts and Crafts Movement was essentially flawed. Their opposition to modern methods of production and the tendency to look back to the medieval world, rather than forward to a progressive era of complete mechanization, was what eventually sounded the death knell of the movement. They could only fail in their socialist ideal of producing affordable quality hand-crafted design for the masses as the production costs of their designs were so high that they could only be purchased by the wealthy. Also, any movement which continually looks to the past for its inspiration must have a limited life span. There are only so many ways you can reinterpret the past without becoming repetitive. However, the greatest legacy of the Arts and Crafts movement was their understanding of the relationship between design and our quality of life. This set the example for others who would later attempt to use the power of industrial mass production in the service of good design. 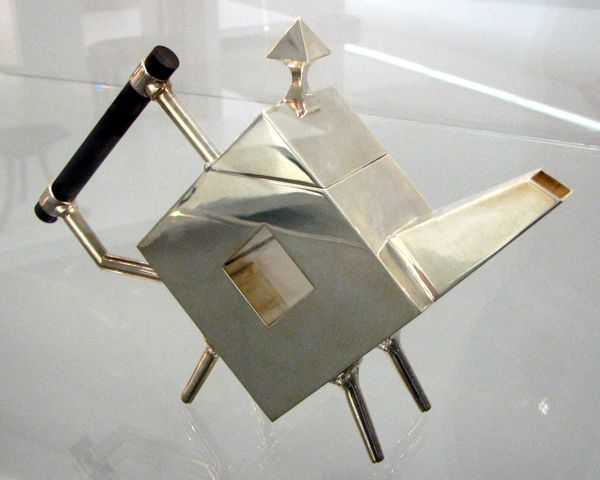 Some designers, such as Christopher Dresser whose work still looks remarkably modern, started to reject the limitations of the Arts and Crafts ideals and positively embrace the techniques of industrial manufacturing. This was the start of a design evolution that would eventually culminate in the foundation of the Bauhaus School of Art and Design which became the prototype for art education in the 20th century. 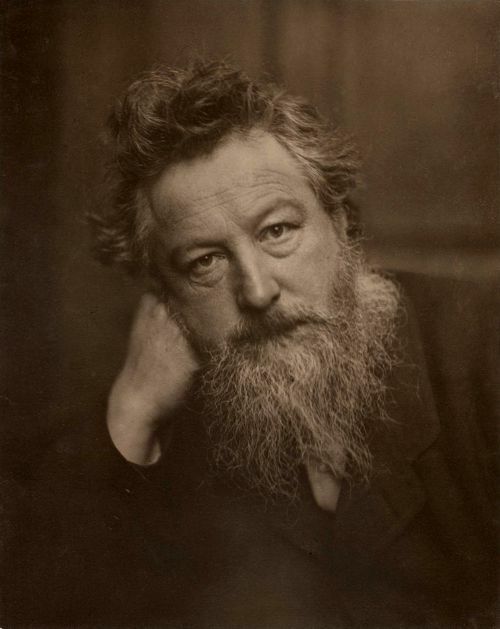 William Morris was a leading member of the Arts and Crafts Movement. 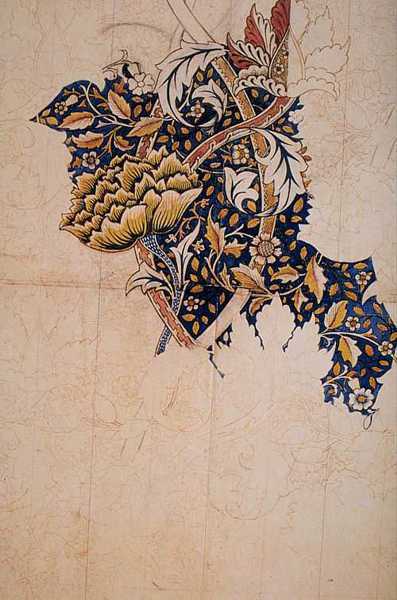 Morris is mostly known as a designer of patterns for wallpaper and textiles. Morris was also an artist, designer, printer, typographer, bookbinder, craftsman, poet, writer and champion of socialist ideals. Morris believed that the art and design of his own time was inferior and unworthy. He felt that this was due to the poor quality of life during the Industrial Revolution. Morris believed that nature was the perfect example of God's design. 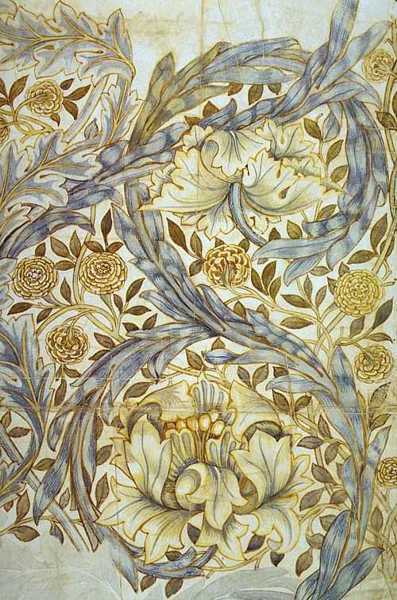 Morris believed that all design should be based on nature which he saw as the spiritual remedy to the inferior standards of art and design during the Industrial Revolution. Morris said, "Have nothing in your house that you do not know to be useful, or believe to be beautiful." Morris encouraged artists and designers to look back to medieval art for their inspiration as this was a time when artists and craftsmen worked together with equal status. Morris founded the Kelmscott Press to create beautiful handmade books which would elevate the craft of printing to an art form. 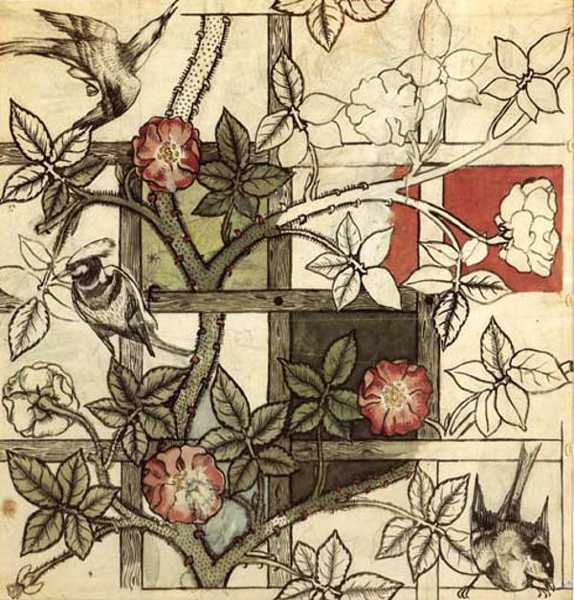 'Honeysuckle' (1876) by William Morris.